Coleus (Solenostemon var. ): growing, planting, caring. A popular houseplant with a colourful foliage - to brighten up your winter ! Scientific name : Solenostemon var. Solenostemon - commonly known as Coleus - is a genus of flowering plants in the family Lamiaceae native to tropical Africa, Asia and Australia. They are bushy, woody-based evergreen perennials - but cold-sensitive under 10°C - growing to 60–75 cm (24–30 in) tall with highly decorative variegated leaves. Several species formerly included have been moved to the genus Plectranthus. 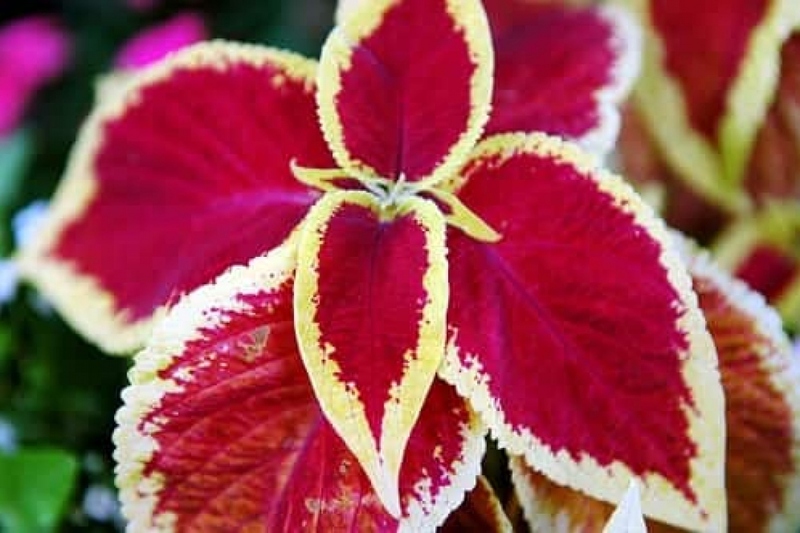 The coleus exists in many cultivars which are interesting by the color of their foliage that can be red, purple, yellow or green, and has very varied shapes. It has opposite leaves, evergreen, downy, on quadrangular stems, erect, branched. It is possible to sow the Coleus - whether to use in the garden as annuals, or in pots indoors. If you plan to use those seedlings in the garden, sow about 4 months before planting. For indoor user, you can sow all year long - as long as the light conditions are respected. Use a flat container with a damp potting soil. Lightly sprinkle the coleus seeds over the soil. Mixing the seeds with fine sand before sowing may help you to spread the seeds more evenly with a bit more of a gap between the seeds. Cover seeds with a fine layer of potting soil, then cover the container with plastic and place in bright, indirect light, in a room where temperatures stay around 18-20°C. You should see seedlings in about two weeks. When you see the coleus seedlings, remove the plastic, and keep the soil moist as the seedlings grow. If possible, water from below. Once the seedlings are large enough to be handled - when they have two sets of true leaves - they can be transplanted to individual containers. When your seedlings have two sets of true leaves, you can transplant some in other containers - spacing them a little more, leaving at least 4 centimeters each. Transplant your coleus into a pot full of potting soil because it likes rich soils. If you decide to put it outside, find a rich, cool location sheltered from the scorching sun. Add compost when transplanting. In pots, keep your coleus permanently in a slightly damp soil, without soaking it. Avoid wetting foliage, this promotes disease. Prune the flower stems, which are of little interest and exhaust the plant, and regularly pinch the ends of the stems to incite your plant to stay low. At the end of the winter, each year, repot your coleus by giving it a slightly larger pot and adding potting soil. Coleus multiplies very well by cuttings in summer or spring. Collect stem extremities on which you should preserve only two leaves. Place it in potting soil that you will keep moist. If leaves whiten, the soil is becoming depleted. In the summer, indoors, shelter your coleus from direct sunlight. Conversely, in winter, put it in full light.